resembling or pertaining to lymph or to tissue of the lymphatic system. Resembling lymph or lymphatic tissue, or pertaining to the lymphatic system. /lym·phoid/ (lim´foid) resembling or pertaining to lymph or tissue of the lymphoid system. 1. Of or relating to lymph or the lymphatic tissue where lymphocytes are formed. 2. Of or relating to lymphocytic cells, including B cells, T cells, and their precursors, that are thought to derive from a common progenitor in the bone marrow. pertaining to lymph or lymphatics. 1. Resembling lymph or lymphatic tissue, or pertaining to the lymphatic system. 2. Synonym(s): adenoid (1) . Pertaining to LYMPH or lymphatic tissue. Tissues relating to the lymphatic system. A thin, yellowish fluid, called lymph fluid, travels throughout the body. The lymphatic system helps control fluids in the body. aggregations of B and T lymphocytes in the lower respiratory tract. small foci of lymphoid tissue which occur in almost all parenchymatous organs in birds. The foci are not encapsulated and blend with the surrounding tissue. one of the lesions in chronic follicular pharyngitis in the horse and a cause of persistent cough, difficulty in swallowing and a stertorous respiration. aggregations of mucosal-associated lymphoid tissue in the gastrointestinal tract, including adenoids, tonsils, Peyer's patches and lamina propria of the intestine; responsible for a local immune response to antigens. a very rare primary tumor in mammals characterized by high blood lymphocyte counts. It is the most common form of the avian leukosis complex of diseases caused by avian retroviruses. Birds are affected between the ages of 14 to 30 weeks and show nonspecific signs of emaciation, inappetence and weakness, but many also have enlarged abdomens and a palpably enlarged liver. The primary lesion is the transformation of B lymphocytes in the lymphoid follicles of the bursa of Fabricius, but multiple metastatic lesions occur in the liver, spleen, etc. aggregations and organized lymphoid cells tissue found immediately beneath mucous membranes lining the respiratory, gastrointestinal and urogenital system. primary lymphoid organs include the thymus and the bursa of Fabricius and its mammalian equivalent; secondary lymphoid organs include lymph nodes, spleen, Peyer's patches, etc. include a group of non-activated T lymphocytes and Langerhans cells derived from lymphatic or hematopoietic tissues which have antigen-presenting properties; enable the skin to maintain a functional immunological relationship with the immune system. Called also SALT. the lymphoid tissue of the body, collectively; it consists of the bone marrow, thymus, lymph nodes, spleen, and gut-associated lymphoid tissue (tonsils, Peyer's patches). a lattice work of reticular tissue, the interspaces of which contain lymphocytes. see lymphoma, lymphosarcoma, thymic lymphoma, leukemia. 1. pertaining to lymph or to a lymphatic vessel. causes distention of other lymphatics where lymph flow is blocked and local edema. the two larger vessels into which all lymphatic vessels converge. The right lymphatic duct joins the venous system at the junction of the right jugular and subclavian veins and carries lymph from the cranial right side of the body. 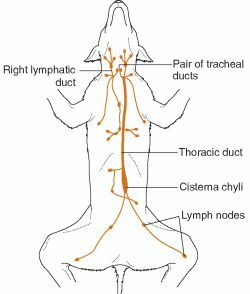 The left lymphatic duct, or thoracic duct, enters the circulatory system at the junction of the left jugular and subclavian veins; it returns lymph from the cranial left side of the body and caudal to the diaphragm. includes distention with lymph as in lymphangiectasia, or thickened as in cutaneous tuberculosis. by local compression, congenital, segmental aplasia, lymphangitis, lymphadenitis. see lymph nodule; may be primary or secondary. inherited as a single recessive in Ayrshire and Hereford cattle; calves are edematous, locally or generally at birth and do not improve; the defect is in aplasia of lymph vessels and nodes. a plexus of lymphatics on the abdominal roof that drain into the cisterna chyli. the lymphatic vessels and lymphoid tissue, considered collectively. See also circulatory system. occurs as a result of pressure from nearby tumors or other space-occupying lesions, because of hypoplasia of lymph nodes in the fetus, in extensive calcinosis, e.g. in Solanum malacoxylon poisoning and in horses not getting sufficient exercise. Called also lymphangiectasia. the capillaries, collecting vessels, and trunks that collect lymph from the tissues and carry it to the bloodstream; called also lymphatics.